THOROUGH INSPECTION – Veterinarian Kim Friedenberg, right, checks Tamra Reynolds’ dog Duke while Jennifer Roach, centre, looks on Saturday morning. Reynolds, left, is preparing for her first Yukon Quest sled dog race. TAKING A LOOK – Veterinarian Matt Allen, right, and volunteer Sandro Holzinger, left, inspect the limbs of musher Nicolas Vanier’s dog Dark, while Vanier looks on. The stars of the 2015 Yukon Quest were cleared for takeoff Saturday. 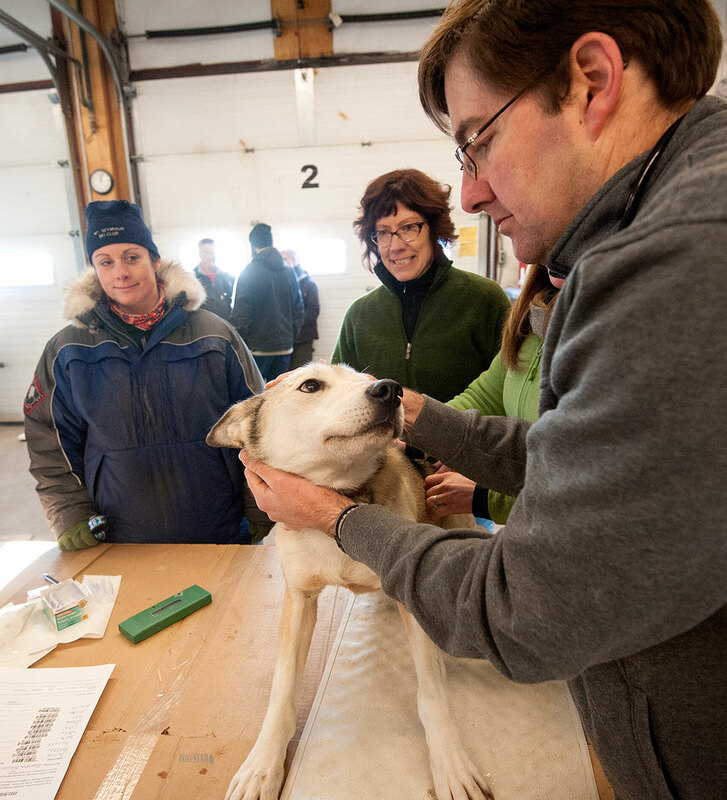 Each of the 26 mushers’ dogs went under the microscope during simultaneous vet checks held in Whitehorse and Fairbanks, Alaska. Seven mushers’ dog teams went through the procedure at Northerm Windows in Whitehorse. Rob Cooke, Magnus Feren Kaltenborn, Tamra Reynolds, Normand Casavant, Nicolas Vanier, Ed Hopkins and Jason Campeau each made appearances in the Yukon capital for the pre-race necessity. Each dog that lines up in the starting chute Saturday will have been thoroughly examined by a veterinarian. While technically a race rookie, the 42-year-old Reynolds has eight years experience from her time as a handler for 2012 champ Hugh Neff. Reynolds, who trains out of the Annie Lake area, said the vets pointed out a couple of “tweaks” that may affect what dogs make her final canine roster. “I’ll keep my eye on them for the next couple of days and just see if they’re small things or if they’re going to linger,” said the Yukoner – one of three female mushers slated to complete the 1,600-kilometre journey. Mushers were permitted to have a maximum of 16 dogs examined, and teams arrived at hour intervals throughout the day. Mushers will begin the race with a maximum of 14, and minimum of eight dogs in front of their sleds. Dogs new to the Yukon Quest were fitted with a microchip in their neck, and their body condition was ranked on a scale of one to nine. Other examinations on the checklist included range of motion, teeth and gums, body functions, heart rate, potential frostbite areas, and a check for possible foot and wrist contusions. Each examination took about 10 minutes. Four vets from Alpine Veterinary Medical Centre volunteered their time at the Whitehorse vet check, including Amanda Breuer, Matt Allen, Kim Friedenberg and Jessica Heath. Heath said each of the dogs examined passed their physicals just fine. In fact, Heath said a typical sled dog is in excellent shape. “Every dog we’ve seen today has been awesome,” she said. “They all look really good and ready to go. The veterinarian said the canine athletes she inspects are completely capable of running a mushing marathon. “They show that they are, right?” Heath said. “Most of the mushers who enter the Quest finish, and when they choose not to finish, it’s usually because they’re putting the welfare of their team against completing the race. Sometimes they make the really tough choice to not finish because they do care about the welfare of their dogs. Meanwhile, Reynolds said her race plan continues to change as her core of veteran huskies haven’t panned out as hoped. That dog just happens to be Juanita – one of Neff’s Golden Harness winners from 2012. The Yukon Quest, featuring 26 mushers, gets underway in Shipyards Park this Saturday at 11 a.m.